When you visit the Adirondacks, especially in the fall, you can’t help but notice all the beautiful deciduous trees that adorn the countryside. Many of those leaf-bearing trees are maples, and that means in the spring, people living in the Speculator area – and all throughout the state – can enjoy the benefit of the sweet sap that runs through those trees. 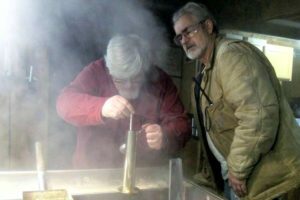 For one Speculator family, maple syrup has been in their family since the early 1900s – a tradition that carries on to this day. Weaver’s Sugar Bush, located in Lake Pleasant, has been producing maple syrup since before 1916. The original operation consisted of Peter Weaver and his sons boiling down the sap in a flat pan. The sugarhouse was built in the summer of 1916, when the family purchased their first evaporator. The family then sold the syrup they produced at their general store. The darkest syrup was sold to a local soda fountain. 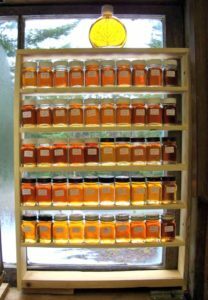 As the years progressed, so did the Weaver’s method of sap collection and syrup production. In 2016, diaphragm pumps were installed, which assists in drawing sap from the trees. And, in 2017, a reverse osmosis system was purchased, which removes the water from the sap, and allows it to become syrup faster and using less wood. At present, the Weavers have more than 700 taps, and still enjoy getting together each spring to make their syrup. The Weavers begin the process mid-to-end-February, when they tap the trees. Boiling begins by mid-March, and by mid-April, the syrup produced is sold at the farmhouse, and given to family and friends as a gift. The Weavers average 100 gallons of syrup a year, and it is available in three varieties – amber, which has a rich taste; dark, which has a robust taste; and very dark, which has a strong flavor. Today, much of the Weaver family still comes together to produce their delicious product. 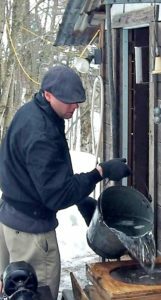 Andy (also the grocery manager at Charlie Johns), Marion, Shelly, William, Aaron, Wayne and Peter Weaver all have a hand in the production of their delectable maple syrup, a favorite springtime treat for generations of people living in the Speculator area. While the Weaver’s syrup is not available in stores, you can still get a taste of it for yourself. 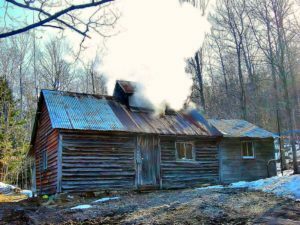 If you see steam rising from the cupola at their sugarhouse, the sap is boiling and you should feel free to stop in for a visit. And, when you see the “Pure New York Maple Syrup for Sale” sign hanging at the white farmhouse, come on in and purchase some delicious syrup for yourself!